Western blot analysis of extracts from various cell lines using F4/80 (D4C8V) XP® Rabbit mAb (upper) or β-Actin (D6A8) Rabbit mAb #8457 (lower). Immunoprecipitation of F4/80 from RAW 264.7 cell extracts. Lane 1 is 10% input, lane 2 is Rabbit (DA1E) mAb IgG XP® Isotype Control #3900, and lane 3 is F4/80 (D4C8V) XP® Rabbit mAb. 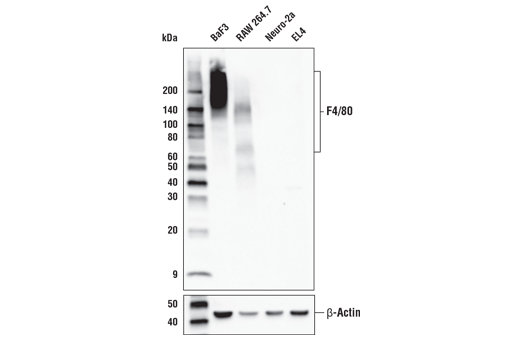 Western blot analysis was performed using F4/80 (D4C8V) XP® Rabbit mAb as the primary antibody and Mouse Anti-Rabbit IgG (Conformation Specific) (L29A9) mAb #3678, followed by Anti-mouse IgG, HRP-linked Antibody #7076 as the secondary antibodies. 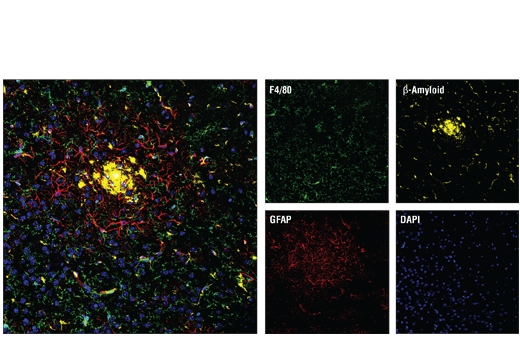 Confocal immunofluorescent analysis of Tg2576 brain, which overexpresses mutant human APP695. Sections were labeled with F4/80 (D4C8V) XP® Rabbit mAb (green), β-Amyloid (D3D2N) Mouse mAb #15126 (yellow), and GFAP (E6N9L) Mouse mAb #34001 (red). Samples were mounted in ProLong® Gold Antifade Reagent with DAPI #8961 (blue). 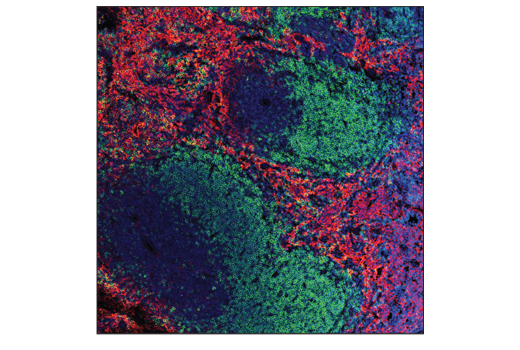 Confocal immunofluorescent analysis of normal mouse spleen using F4/80 (D4C8V) XP® Rabbit mAb (red) and B220/CD45R Alexa Fluor® 488 conjugate (green). Samples were mounted in ProLong® Gold Antifade Reagent with DAPI #8961 (blue). 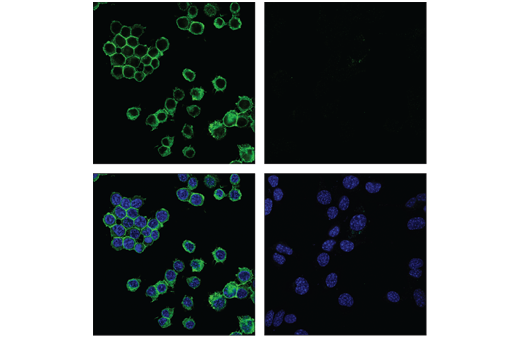 Confocal immunofluorescent analysis of RAW 264.7 cells (left, positive) or Neuro-2a cells (right, negative), using F4/80 (D4C8V) XP® Rabbit mAb (green). Samples were mounted in ProLong® Gold Antifade Reagent with DAPI #8961 (blue). 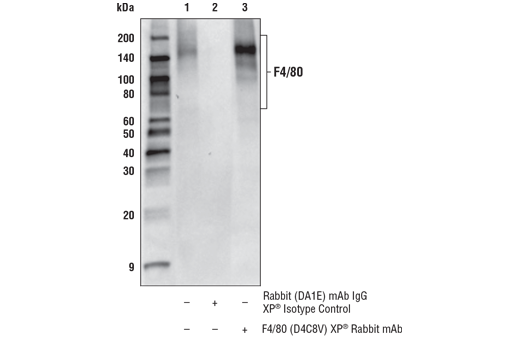 F4/80 (D4C8V) XP® Rabbit mAb recognizes endogenous levels of total F4/80 protein. Monoclonal antibody is produced by immunizing animals with a synthetic peptide corresponding to residues surrounding Gln260 of mouse F4/80 protein. F4/80 (EMR1) is a heavily glycosylated G-protein-coupled receptor and is a well-established marker for mouse macrophages (1-3). Expression of F4/80 has also been observed in microglia and subset populations of dendritic cells (4). Hirsch, S. et al. (1981) J Exp Med 154, 713-25. Austyn, J.M. and Gordon, S. (1981) Eur J Immunol 11, 805-15. McKnight, A.J. et al. (1996) J Biol Chem 271, 486-9. Greter, M. et al. (2015) Front Immunol 6, 249.